With the S16 VOERE offers a handy and light weight rifle that accepts AR-15 type magazines. A light weight 20” steel barrel in a carbon fiber wrapping helps to reduce the weight to just under 2 kilos or 4 pound 6 ounces. A permanently attached muzzle brake helps further reducing the already low recoil of the 222 Rem., 223 Rem., 300 Whisper and 300 AAC Blackout cartridge in this light weight bolt action rifle. The S16 comes with a two lug bolt yet only 60° opening angle, which allows for fast operation of the bolt, and a 2 position firing pin safety. Simply press the safety lever down to engage the safety or up to be ready to fire. 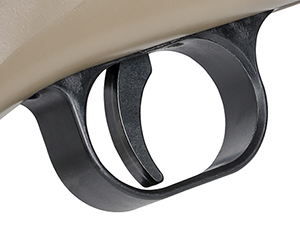 A red and a white dot on the bolt shroud indicate the safety condition of the rifle. The two stage trigger brakes crisp at 2 kilos or 4 pound 6 ounces respectively. 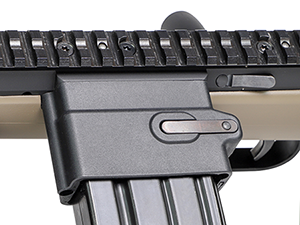 One characteristic feature of the S16 is the laterally attached magazine. This allows for easy reloads, especially when shooting in prone position, and accepts basically all AR-15 type magazines on the market. Depending on the design of the magazine follower, it will also work as a last round bolt hold open. The bolt catch is attached to the left side of the action. Just press the button to extract the bolt. Also the cheek rest can be adjusted in height by using either a 3mm Allen key or size 15 Torx key. 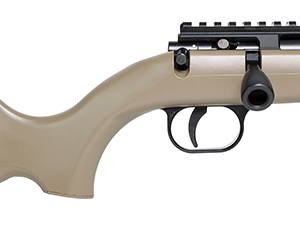 The length adjustable stock can be fixed in 5 positions by pressing the quick adjustment button on the right side of the stock.